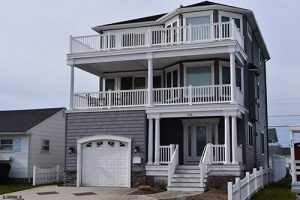 New Construction BY WOERNER CUSTOM BUILDERS – New Beach Block Home with Fantastic Ocean Views BY WOERNER CUSTOM BUILDERS. This Beautiful Home will Feature 5 Bedrooms and 4 Custom Baths, Showcasing Reverse Living w/ Sprawling Open Floor Plan and Elevator. 1st Floor – 2 Bedrooms, 1 Bath, Bonus Room and Large Garage. 2nd Floor – Master Bedroom with Master Bath, Spa Shower and Large Front Deck. Jr. Master Offers a Private Bath. 3rd Floor – Gourmet Granite Kitchen w/ Exclusive GE Cafe SS Appliances, Hardwood Flooring, Dining Room, Living Room with Gas Fireplace and Sliders to Expansive Front Deck. Bedroom w// Full Bath. Perfection Coupled with Luxury at the Beach!